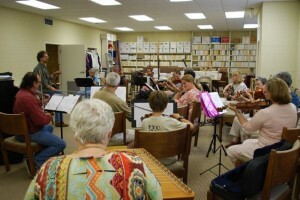 The Gulf Coast’s Irish Trad Workshop Group ! Learn tunes in a friendly and supportive environment with others who are at the same skill level! If you already play violin, flute, whistle, accordion, concertina, Irish tenor banjo, mandolin, guitar (at an intermediate or higher level) and want to learn to play traditional Irish tunes in a group situation – the way musicians play in Ireland – then this SLOW SESSION is for you. Tom teaches tunes from the Irish musicians’ trad repertoire at half-speed. Students learn from sheet music (provided) and by ear and may want to bring a recording device. Participants are encouraged to memorize the tunes they learn. In later sessions we mix learning new tunes from music and playing older ones from memory. CONTACT TOM MORLEY at:thefiddlecenter@gmail.com (or call 251-928-0987) to learn more about joining the Fairhope Irish Trad Workshop Players!